Double-Hung Replacement Windows are known to be the most popular window style on the market. According to Wikipedia; A double hung window is the traditional style of window with two parts (sashes) that overlap slightly and slide up and down inside the frame. The two parts are not necessarily the same size. Currently most new double-hung sash windows use spring balances to support the sashes, but traditionally, counterweights held in boxes on either side of the window were used. These were and are attached to the sashes using pulleys of either braided cord or, later, purpose-made chain. Three types of spring balances are called a tape or clock spring balance; channel or block-and-tackle balance; and a spiral or tube balance. Double-hung replacement windows can be fitted with simplex hinges that let the window be locked into hinges on one side, while the rope on the other side is detached—so the window can be opened for fire escape or cleaning. 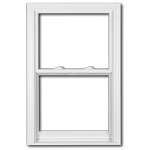 A window where the upper and lower panel (or sash) both move up and down are called double hung windows. Having two moveable sashes makes for very easy cleaning, as both panels can tilt inwards. Featuring a classic frame design and a vast selection of styles, the Simonton Reflections 5500 series represents the upmost in energy efficiency and long-lasting beauty. Available with the most popular designer options and high performance glass packages, you can customize 5500 double hung replacement windows and doors for your home and lifestyle. There are many different replacement window styles to choose from. Click on this link to find out more by Simonton Windows. Call Jeff today for more information regarding Simonton Reflections styles 770-318-8514.